Description: A practical bully prevention program that shares workable strategies and valuable tools from the expertise of Dan Olweus, Bullying at Schools Bully-Free Schools: Circle of Support, Dee Lindengerger with Strategic Alternatives in Prevention Education, Margaret R. Kohut, Bullies and Bullying, Barbara Coloros, The Bully, the Bullied, and the Bystander, Stan Davis, Schools Where Everyone Belongs Cheryl Dellasega, PHD and Charisse Nixon, PHD. Girl Wars, Judge Tom Jacobs, Teen Cyberbullying Investigated. Richard’s continuous research helps him to offer up the latest parent bully prevention information. Presented through easy to understand techniques that help parents recognize the importance of standing firm to tame aggressive behavior, while teaching and reinforcing pro-social and positive behavior skills. Attendees will discover the importance of a positive home environment that that includes clear limits and consequences. "I thought the presentation was great. The parents who came were ones that I was pleased to see attend. Richard did a great job of tying in how the use of Atwood’s bully free school plan works with our rubric and reflections we use with the kids. " Richard Paul’s Eliminate the Bullying parenting program mixes his humorous lecturing style with group-energizing activities that are cleverly designed to promote audience interaction and brainstorming. It is an educational, interactive workshop that includes a power point, real life success stories, ventriloquism and valuable strategies to prevent and reduces school bullying, cyber bullying and aggressive behavior. Parents will come to understand that they are a valuable bully prevention asset to their school and child’s growth and emotional development. Workshop Goal:To offer up effective parent/student strategies that help identify bullying and the tools they can implement to prevent, confront and defuse negative behavior. Projected Outcome:Attendees learn what bullying is and how it creates an unhealthy environment. They also learn to work together with the school administrators, counselors and teachers as a team to be proactive when it comes to reporting, speaking up and getting involved to help eliminate bullying behavior at school, on the bus and at home. "He kept everyone involved so we could use one another as resources in addition to the "
tips and suggestions he shared during his session." Activities include: Interactive lecture, humorous anecdotes, discussion, small group activities and large group participation. Handouts:Client will be given master copies of handouts, evaluation and resource materials for them to copy and distribute the day of the event. Presentation fee depends on location and style of presentation requested. Bullying Ben: This is a great bully prevention book to read and discuss with your children. This book is an historic fictional and inspirational story of how Ben was able to rise above the bullying and move on to accomplish great things in his life. Through his will to never give up, Ben was able to overcome his despair. It is our hope that this story will help inspire children who are victims of bullying to understand that they are not alone. No Bully Curiculum: Seven valuable lessons parents can also implement at home to reinforce positive behavior skills and help work through bullying on the bus and in school. Bullying Ben book and assembly program: Bulling Ben - Building Good Character reinforces core democratic values, good character, self-esteem, and social/emotional competence. It is a fun interactive assembly program that is based on author Richard Paul's and co-author Timothy Pina's internationally renownedchildren's book "Bullying Ben". A story that shares the little known fact that young Ben Franklin was a target of a bully. In the book and during the assembly the students learn how he worked through it, and why he made the right choices to improve his life and his community. 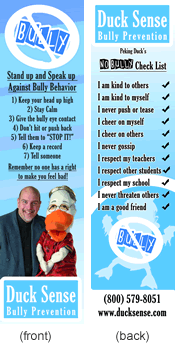 Duck Sense Bully Prevention Curriculum and Classroom Activities: The Duck Sense Curriculum and Activities Book is a great supplement to other curriculums and programs you may already have established at your school. It has received rave reviews from the principals, teachers, and counseling staffs. It is the type of program that can work within the goals and objective of the school's positive behavior support program. Geared for Grades 1-6. It is 166 pages of valuable bully prevention strategies, discussions, activities, handouts and creative positive behavior awards and certificates. Bully Prevention Bookmarks: Hand these out to all your students as a reminder not to bully and what to do if you are bullied. These are a great reinforcements to the No Bully Club Curriculum or your school no bully program. Price: 250 for $35.00 .